The photograph of the three-year-old boy washed up on a Turkish beach has been seen across the world. The picture is harrowing. He could easily have been one of my grandchildren; like the policeman who carefully carried him from the beach, I wanted to pick him up and hold him. This was no way to die. His five-year-old brother also died, two in a party of eleven who all drowned while trying to get into Europe. They were all from Syria. It has been revealed tonight that the mother did not want to go on the journey. It seems the family could have stayed behind in the Kurdish part of Syria, where they were quite secure. The media is taking advantage of the death of the two boys to put pressure on western governments to take in more refugees. Their thinking does not go very deep. 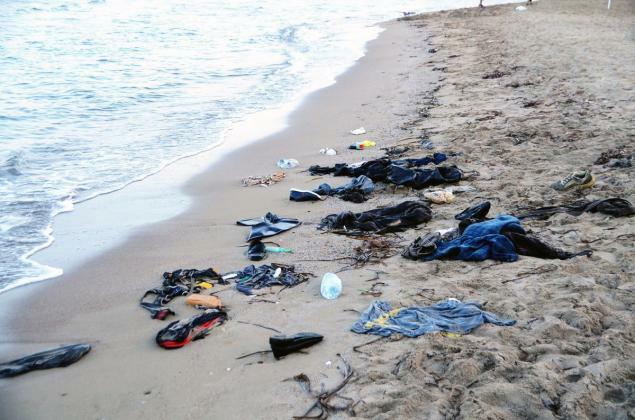 Incidents like this drowning are the result of illegal people-smuggling. People smugglers charge as much as 3,000 euros ($3,450) per person to be taken a short distance into Europe, by boat, truck or train. Hundreds or thousands have died when boats have sunk; dozens more have suffocated to death in trucks. Governments have forced people off trains, insisting they follow international agreements that require them to register in the first country they enter. They won’t because they want to get to Germany, the richest country, which emphasizes the blurring line between refugee and migrant. Refugees, like the three-year-old toddler and his family, are fleeing war or persecution or both. Migrants are moving to Western Europe in order to better themselves. They could apply for a work visa like millions of their countrymen who have entered Europe legally. But they are taking advantage of current chaos to get into what they consider paradise. One report from Budapest this morning showed a train full of migrants. They came from 67 different countries. Only Syrians and, maybe, Iraqis and Libyans truly qualify as refugees at this time. Others are migrants. They can and should be returned home. They should not be allowed to become a burden on European tax-payers. The Hungarian Prime Minister, Viktor Orban, wrote an article on the migrant crisis that appeared in a German newspaper today. He warned that the migrant crisis threatens Christian Europe. Donald Tusk, the Polish President of the European Council, responded by saying that the first duty of all Christians is to help those in need, regardless of race or religion. Surely, the solution is simple. Return all migrants, those seeking a better life in Europe. The EU has a high unemployment rate and a number of countries haven’t got the money to provide free healthcare, free education and welfare to all those arriving. They can be sent home, where they can apply for legal entry into their country of choice. Establish a temporary, guest worker program for all refugees, providing them with peace and security and an opportunity to work for up to five years. Change the citizenship laws. That’s the real problem here. The Hungarian prime minister is correct when he says Christian Europe is threatened, though, frankly, Europe has not shown much Christianity down through the centuries. What he means by this is that ethnic Hungarians, Germans, French, etc., could easily be overwhelmed and their countries could be taken over by peoples of an alien culture and religion. Go after the people-smugglers. They have no respect for human lives, not even the lives of 3- and 5-year-old little boys! Life in prison is too good for them! Deal with it. Sink their boats. Close the borders effectively. Put pressure on other Arab countries to take in Syrian refugees. They will have a much better prospect of assimilation in a neighboring country than in Europe or America. Increase pressure on Syria’s President Assad who is largely responsible for this mess. The US President should have followed through with his “red line” to remove Assad when he used chemical weapons on his own people. US policy toward Syria has been totally ineffective. It’s not all Obama’s fault – President Putin, another leader who does not care about people, supports Assad. Advertise on television. Yes, that’s right. Satellite TV is encouraging this massive migration of peoples – they see television programs from the West and want to move to a western country. This is attracting migrants from all over. Western governments would do well to show that their own countries are not the paradise many think. Abolish the generous welfare systems that attract migrants. Scenes from Hungary shows them resisting efforts to make them register in poorer Hungary, knowing this will stop them from being able to enter richer and more generous Germany. Those trying to cross the Channel Tunnel know well that the UK’s benefits are more generous than France’s. If these measures are applied, Europe can be saved and so can the people of Syria.